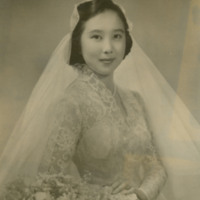 Elizabeth Liu Chu (Class of 1952) photographed in a wedding dress. The inscription on the back reads "For dear Miss Mac George - from Elizabeth Schenectady, N.Y. 1953." 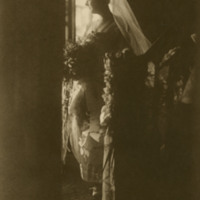 Photo of Anne Worthington standing at the bottom of a staircase and wearing a wedding gown.